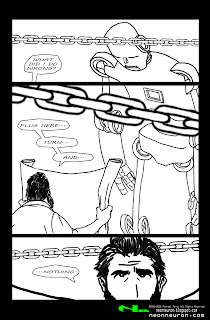 This was the third page for the intro comic to the Neon Neuron website. Not much to say about this one. I think it's okay. Using the chains as framing elements is still in the works. Or, I have no idea what I'm doing if you want to be a jerk about it. I was playing with speech and timing with this page. Using bubbles to separate the words was supposed to slow things down and give a sense of confusion. Let you in on the mood that the Custodian was feeling. I think, now, that the chains have too much a prominent role in the visuals right now, add their ambiguity and the whole thing just gets a bit confusing. 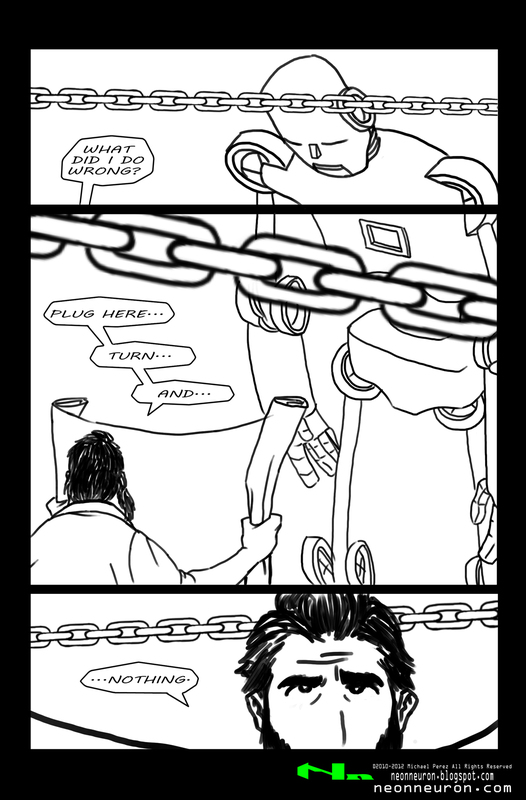 When I go back and finish this story, I'll make the chains a tad more subtle by fading them or using thinner lines. I do like the way the Custodian seems to be looking back up at the still broken Engine from the bottom of the page.